This book has been around rather a while - in fact it has been on my review shelf for a long time, because there are enough of these books out there (think Prof Stewart's Cabinet, Casebook, Incredible Numbers...) that I thought I'd already reviewed it. The format is familiar - a series of very short articles, which could be mathematical puzzles, logic puzzles, fun mathematical factoids and so on. 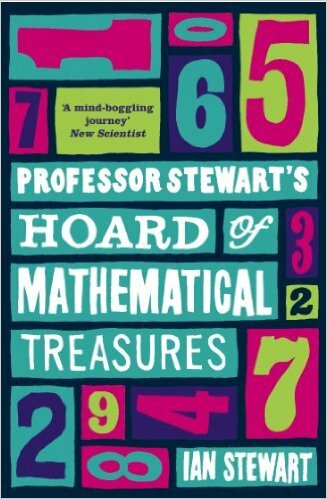 The chances are that few readers will find every item interesting - for me, in this book, it was about 1 in 3 - but anyone with at least a vague interest in maths will find some of it worth a read. Personally I only like the puzzles I can pretty much work out in my head in under a minute - anything requiring any more effort is too much like being back at school and being set homework. I also find the need to keep flipping to the back of the book to see the solutions a pain - it would have been much better if the solution to each puzzle was after the puzzle, so you could read the book sequentially. Apart from those quick-to-work out puzzles I also enjoyed the historical and biographical articles. Most of the latter seemed to be about mathematicians being extremely eccentric and, say, forgetting who their own children or friends are - I'm not sure Ian Stewart is selling the joys of mathematics very well if this is what it does to your brain (I know, I know - correlation isn't causality). For me, then, there just wasn't quite enough that clicked to make this a really enjoyable book. But if you like working out how to make a star from a folded piece of paper with just one snip from a pair of scissors, devising magic hexagons (magic squares are just so passé) or working out which three digit numbers are the sum of the cubes of their individual digits (still awake?) then this is very much the book for you.